SHEPHERD Chartered Surveyors has been instructed by the University of Aberdeen to sell a substantial development opportunity on 153 acres at Rowett North – the largest sale of business land as a single entity in the North East for some years. 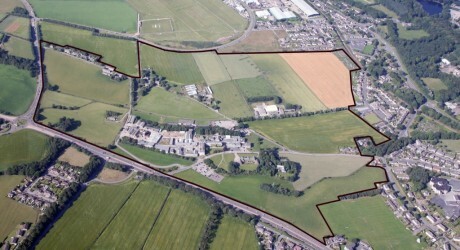 And having secured zoning as employment land within the proposed Aberdeen Local Development Plan linked to its existing planning status, Rowett North has the capability to be developed within a relatively short timescale, offering a far clearer passage to delivering development than some other sites with infrastructure challenges. Located at the heart of the site is the Rowett Research Institute, with the site comprising a series of research, academic and agricultural style buildings extending to 270,000 sq ft; the remaining sections of Rowett North being predominantly laid to agricultural use. Situated on the north western periphery of Aberdeen, Rowett North is adjacent to the Bucksburn and Dyce districts of the city. The estate enjoys access off the A96, the main commuting route from the city centre to Dyce, Aberdeen Airport and the towns to the north west. The surrounding area is of mixed use with Bucksburn comprising a range of residential properties, whilst Dyce comprises an established industrial/commercial location with Aberdeen Airport also in very close proximity. The site accommodates a number of prominent buildings, including: Strathcona House, currently used as a lecture theatre, dining hall, offices and residential accommodation; The Boyd Orr Building, comprising a mixture of laboratory and office space; The Reid Library, laid out to provide offices and Wardenhill House, a detached dwelling house in an attractive tree lined location. Each of these properties is considered suitable for redevelopment or conversion, subject to gaining the appropriate local authority consents. The site also has a residential portfolio consisting of 23 detached and semidetached houses and bungalows. Aberdeen City Council has designated the site as ‘desirable’ and noted that it ‘would be an ideal location for employment development and making use of some of the existing buildings for residential use’. “Given Aberdeen City Council’s planning policies, it can be seen that this site offers significant development potential for a variety of uses,” said Grinyer.